In this cinema white paper, we review the development of attendance, ticket revenue and ticket prices over the last years. Furthermore, we examine the pricing models of the top German chains. In the end, we look at the pricing innovations that may shape the next years. Pricing in the German cinema industry has matured over the last years. What’s more, various price surcharges and discounts give customers more choice in what they are willing to pay – however, not all techniques are beneficial to customers and exhibitors. 2016 was a year with strong blockbusters like Rogue One: A Star Wars Story and Finding Dory which were filling the cinema halls. Even though it was not the best one in terms of attendance in Germany, exhibitors listed more than a billion Euro in annual revenue, which means a rise of 11.5% since 2010. In this study, we review the development of attendance, ticket revenue and ticket prices over the last years. Furtermore, we examine the pricing models of the top German chains and look at the pricing innovations that may shape the next years. By giving discounts for tickets purchased online, cinemas can increase their online share. Unlike reservations, web purchases ensure revenue, reduce operational cost and allow cinemas to collect data. Bundling is beneficial for customers to purchase more. 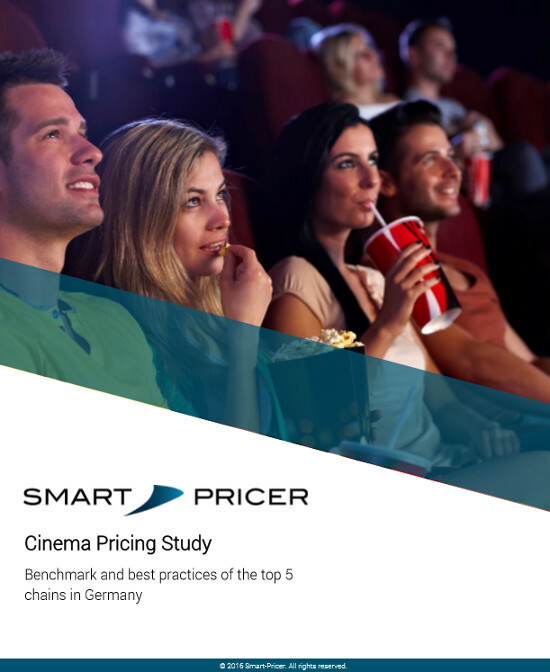 By offering bundles, cinemas simplify the purchasing experience for their customers and generate higher food and beverage revenues. Dynamic pricing allows the base price of films to adjust to the actual demand conditions, such as movie life cycle, show time, day of the week, and actual bookings. Download the document by entering your email address in the field below. You will automatically subscribe to Smart Pricer’s newsletter for regular news and updates.